This one could have gone either way. However it went, I knew that it’d provide good fodder for conversation, since Mom’s an ordained American Baptist minister, and she has an interest in the women of the Bible. But I’ve seen some bad Biblical theater. And I’ve seen some bad feminist theater. And if I’m honest, my luck in those genres as an audience member has not generally been good. The rare fantastic shows were vastly outnumbered by the well-meaning but subpar ones. So I went into this one with my fingers crossed. And this time, we got lucky. The Womyn’s Mysteries was a most welcome Fringe surprise, a solid new ensemble created show spotlighting both the well-known and lesser known female figures in the Judeo-Christian religious traditions. Even if that subject matter isn’t your thing, or you wouldn’t find it spiritually relevant for you personally, just getting some more strong female role models onstage is reason to celebrate. The See-Saw Theatre Lab has gathered together a laudably diverse cast of women under director/producer Chava Curland’s guidance - it’s diverse in terms of age, race, and body types. 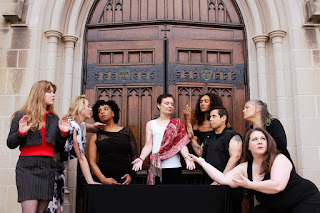 The women who crafted and performed this piece are Jex Arzayus, Jody Bee, Vinecia Coleman, Katherine Engel, Kate Kennedy, Erika Kuhn, Gina Sauer, and Samantha Joy Singh. The Womyn’s Mysteries are stories not often told, in a way they’re not often told. It’s a good piece of theater that gets you thinking, and hopefully helps you better appreciate the challenges faced by the women in your own personal history. Plus, it gave Mom chills, so bonus points for that.